I was watching a property program the other day where newbie property developers were competing to make the most profit possible on their renovated properties. We’ve all seen these programs, haven’t we? Anyway, this particular program was one from a few years ago and it featured an entrepreneur who lives locally to me called David Fishwick who was featured in a Channel 4 documentary series called Bank on Dave a few years back. During the program, Dave was helping one of the wannabe property developers out by taking them to a carpet store and helping them to get the best deal possible on the carpets and flooring for their renovation project. There were many great tips in the program but one that really stood out to me – because it can be applied to pretty much every area of our financial lives – was this, Dave said ‘Every pound that you spend is a pound that you don’t have for something else’. Now, I know what you’re thinking. You’re thinking ‘that’s pretty much stating the obvious, isn’t it?’. While it’s true that it is stating the obvious, when you really think about it, how many of us really think this way in our day to day lives and how much better off might we be financially if we did remember this thought before we spend our hard earned cash? Sure, I admit that there are limits to this reasoning. We all have to enjoy life and this will inevitably involve spending some cash on unnecessary luxuries. But what about the rest of the things that we waste money on each day that, let’s face it, we really could live without and that it wouldn’t really hurt us to forego? Can you imagine the other things that you buy if you were to put the money you would ordinarily spend on these things to one side? We all know what the main culprits are when it comes to those ‘insignificant’ spends. Coffees, sandwiches, takeaways and the like. But what about those bigger spends, such as the kind of house we choose to rent/buy, the appliances we buy, the holidays we take? Do we then throw the principle of ‘every £1 you spend is a £1 you don’t have for something else’ out of the window by refusing to shop around or save money in other ways? Do we forget to make use of Cashback deals*, for example, or even neglect them because we just can’t be bothered with the hassle of logging in when it will ‘only save me a few pounds’? 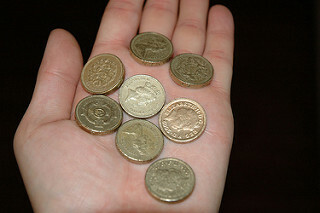 Remember, every pound that you spend is a pound that you don’t have for something else. So, the next time you are planning to buy something big or small, take a moment to think about what any pound you save when making the purchase could be used for in some other area of your life. Could you put it towards a family holiday or invest it in a SIPP* or ISA* to save for your future? If you can think of a better way that you could be using any pound that you are able to save, then why not go ahead and save that money towards something more worthwhile? So true. Every little expense we make do add up however small. I am totally guilty not using Cashback deals, I see them as waste of time. It’s high take at closer look and save myself some money. Thanks for sharing. YES. So agree. I am always saying this to my husband!